The strategic assumptions from Constellation’s 2014 PESTEL framework form the basis for the business theme-led research. Over the next 36 months, research from each business theme will factor these trends into the overall research agenda. The goal in 2014 is to help clients not only navigate, but also dominate digital disruption. In part 1, the focus was on the technological trends. In part 2, the focus is on societal. Access trumps ownership in a sharing economy. From car sharing in the late 1990s, to vacation rentals to collaborative financing, the sharing economy has been inching its way into the forefront of the consumer’s mind. Since, thought leaders such as Rachel Botsman, Lisa Gansky and Anne-Sophie Novel, have been chronicling the forces, underlying trends and players behind the movement. Key success factors in this new business model require the identification of underutilized assets, optimization of value through time slicing of access, trading on the goodwill and generosity of others and building a reputation economy. A sharing economy model is not for every industry, yet this trend may affect how products and services companies shift their offerings and business models in the next three to five years. Five generations of customers and workers driven by digital proficiency, not age. When discussing the future of work, most people immediately jump to the discussion of millennials, Generation Y, Generation X, Baby Boomers, post war, etc. However, under a shift to digital business, the generations are defined differently. This segmentation describes how proficient people are with digital technologies and digital culture. The five generations include digital natives, digital immigrants, digital voyeurs, digital holdouts and the digital disengaged. transparency become paramount, as authenticity remains the Holy Grail of corporate and personal brands. There is a battle for Personally Identifiable Information (PII) at the heart of many digital business models; consumer awareness of how their PII fuels business will lead to agitation for transparency and a better deal. One will expect to see new privacy compacts emerge! Generational and class warfare favor redistribution programs. A digital divide pits those succeeding in a digital economy against those shackled by inequality of access. While equal outcomes are not expected, society must provide access and equal opportunity. Meanwhile, generational warfare has arrived, as younger individuals may have to subsidize older individuals for healthcare, social programs, and other government obligations. Concurrently, the lack of jobs for the young (for example, 50 percent unemployment in Spain for those under the age of 26) will disenfranchise a generation. Those more digitally enabled may have to subsidize those less so or be bullied into providing more digital opportunities. Resentment and backlash emerge toward Silicon Valley for disruptive technologies and business models. Societies now realize the good, the bad and the ugly with how disruptive technologies can affect business models. Expect a growing backlash against Silicon Valley, the venture capital firms, technocrats and tech geeks who decimate high paying jobs and against businesses using technology as a weapon without considering the human toll. In addition, the growing gap in wealth and an increase in power allow Silicon Valley to reshape the world to its needs. Similar to the Occupy movements against Wall Street, these movements represent the tip of the iceberg in social unrest and populist action. 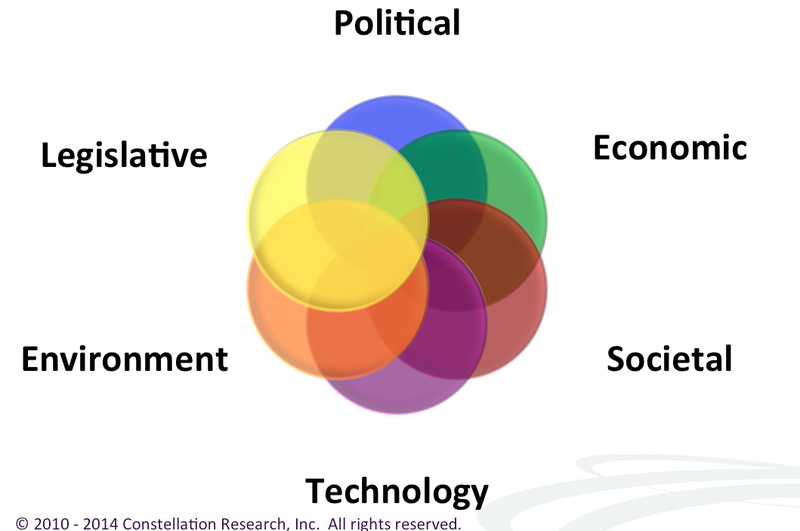 The premise behind the Constellation Futurist Framework requires the broader perspective of five other areas: political, economic, societal, environment, and legislative. When taken in concert, boards, CEOs, management teams, and strategic advisors will have a set of trends that provide context to the digital disruption ahead. The framework is just the beginning. A successful strategy will build on this futurist framework to map out the next 24 to 36 months of business model disruption.